Could the impact of London’s ULEZ and the UK’s forthcoming clean air zones on fossil fuel cars – and vans – mean issues for the new and used car markets? Natalie Middleton speaks to the experts. Anti-diesel sentiment over the past few years has made buyers consider which is the right fuel choice for them and their driving needs. 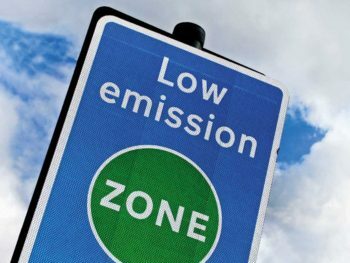 We all know that fossil fuel-powered cars and vans will eventually become a thing of the past but will London’s new Ultra Low Emission Zone (ULEZ) and the proposed implementation of clean air zones (CAZs) across the UK force change quicker? Certainly, it’s something that vehicle finance firm Mann Island Finance believes; it’s said in the last month that diesel and petrol car sales are expected to decline at an accelerating rate with the advent of clean air zones, impacting on future values. So even though Euro 4 petrols and Euro 6 diesels cars/vans will be fine to use such zones, could the advent of CAZs affect buyer interest, and what’s the outlook for used values? He added that looking a little further into the future, petrol’s share of the new car market will start to fall while the share of ULEVs will start to rise, but this will also be down to the wider choices of ULEVs. But Martin Potter, group managing director of Aston Barclay, does think that the London ULEZ will help push companies to petrols as well as new hybrids and EVs, following a similar pattern to when the Congestion Charge was first introduced. He also believes the van market will see more operators start to consider electric models seriously for deliveries in and around London, further boosting the used market. However, he says Euro 6 diesels will remain the mainstay light commercial for those companies who travel longer distances in and out of the capital each day to ensure they avoid ULEZ fines. Meanwhile Alex Wright, managing director, Shoreham Vehicle Auctions, says that the imminent arrival of such schemes is already having an impact on the used market, pointing to ongoing rises in demand for electric vehicles and Euro 6 used vans. But he says demand and prices for used diesel vans remain strong across the board; those fleets not geographically located near the zones are happy to still buy Euro 5 vehicles, which is upholding demand and prices. Finally, Cox Automotive has also dismissed any concerns over the impact of the ULEZ/CAZs on the used market, including for diesels. Philip Nothard, customer insight and strategy director – cars, pointed out that ‘Dieselgate’ has already led to a huge reduction in the number of new diesel cars entering the market, and the company predicts that demand will hold steady, keeping values in line with the market in general. And James Davis, customer insight and strategy director – CV, has moved to dispel current speculation that Euro 5 van values are beginning to suffer.